Refill your balance to keep running your advertising campaigns. Did you start an advertising campaign? The Chartboost network is primarily for free games. Go to Manage Funds > Add Funds in your dashboard, or just click here to go there. PayPal: Add funds from your Paypal account. Paypal fees will be deducted from the total. The minimum deposit through Paypal is $150 USD. Wire / ACH: For amounts over $150, we also accept wires and ACH. Wire instructions are available in this PDF. Please indicate your account name and the amount you wish to transfer. Transfer from publishing earnings: If you’ve earned revenue through publishing campaigns, you can transfer these earnings to your advertising balance. This transfer option will not send funds to your bank or PayPal account, only to your advertising balance. When you add funds to your advertising balance sometimes these are not immediately available. The causes can be different depending on your type of transfer. Transferring via PayPal: When you transfer money via Paypal the funds are usually made available instantly. However, in some edge cases, it may take up to 1 business day to show up on your dashboard. If more than 1-day passes and the funds are not available you should contact us (include your receipt of deposit) so we can research further into the issue. Transferring via Wire transfer or ACH directly to Chartboost: These type of deposits are only made during business working days and because of this, it can take longer to process your transaction. In order to ensure that transfer is deposited in your account in a timely manner make sure to always reference the invoice number on the payments and use the same bank account, to make the transfer, as the one you have registered on your Chartboost account. If you are experiencing difficulties with your transaction you should contact us (include your wire transfer receipt) so we can research further into the issue. Domestic (US) Up to 4.0% plus $0.30 per transaction No Chartboost fee Free! International Up to 4.0% plus $0.30 per transaction No Chartboost fee Free! 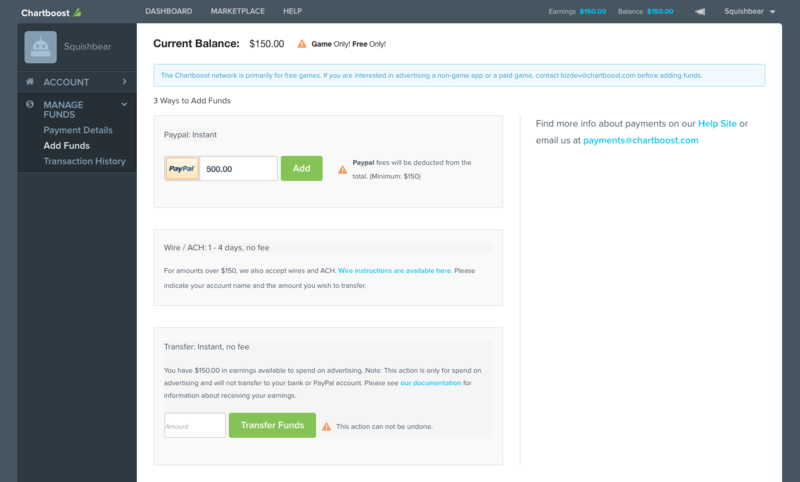 Chartboost does not charge any incoming wire fees. However, your bank may charge a wire fee of approximately $20-$35. We suggest that you add the note Charge Our to your wire instructions so the full wire amount gets credited to your advertising balance.